My dual base amplifier is built to match remote wideband loops to a coherent two-channel receiver. Implemented with wideband FET op amps, performance is great. As I learned to hot air solder SMD components, the dual base amplifier board was my third attempt. Surprisingly, the first time I powered it up, it worked perfectly. Check out the circuit described previously. 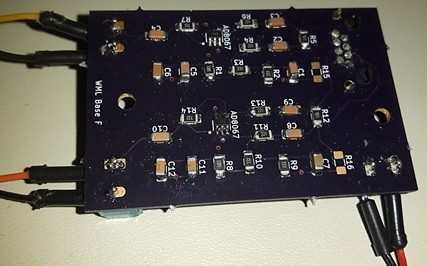 This board is designed to match signals from two remote wideband loops, using CAT transmission line, to a dual channel receiver. An RJ-45 connector (upper right) sends power to the head end amplifiers, and receives balanced signals from the loops. Basically, I designed an amplifier around the AD8067 high speed FET op amp and built two of these onto one board. Power and receiver antenna connections are made using screw terminals. Otherwise, all the parts are surface mount. I thought this would be the hardest board to build. Fortunately, I had some practice before tackling. Hot air soldering actually works pretty well. As a side note, I was also able to use solder paste to hot air solder the eight pins on the RJ-45 connector. This seems to work okay when you have small pins that are very close to the board pads. Not so with the screw terminals, which needed through hole soldering. You might be amazed at this, but my dual base amplifier performs exactly as LTSpice projected. The test was to feed a 50 mV signal at 10 MHz to Channel A input. Output was 364 mV peak-to-peak, for a gain of 21 dB. This was pretty much as modeled in LTSpice. Next I ran a frequency sweep from 100 kHz to 30 MHz. To my joy, gain was constant across most of the range, dropping off slightly above 25 MHz. You can see input (yellow), output (blue) and FFT in the picture above. Current drain was 13 mA for the dual base amplifier, just as predicted with the LTSpice model. By the way, EasyScopeX software does a great job of capturing screen graphics from my Siglent 1052 digital oscilloscope. The FFT function is particularly useful.